Charmaine Minniefield draws from indigenous traditions as seen throughout Africa and the Diaspora and her personal connection to women who have played a major role in her life. Her work explores African and African American ritual from a feminist perspective by pulling the past to the present, conversing between spirit space and the physical. Her community-based initiative, The New Freedom Project seeks to preserve black narratives by creating public art in communities affected by gentrification and erasure. Her community murals can be seen at numerous locations in Atlanta and beyond. Her recent public work includes projection mapping and site-specific installation. With a degree in Fine Art from Agnes Scott College, Charmaine Minniefield has also served the Atlanta area as an arts administrator for nearly 20 years, holding positions with such arts organizations as the National Black Arts Festival, the High Museum of Art and the Fulton County Department of Art and Culture, producing projects around art and activism with such organizations as Alternate ROOTS, Points of Light and Flux Projects. 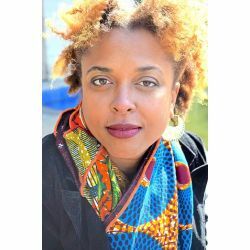 She recently served as faculty for the Department of Art and Visual Cultural at Spelman College and currently serves as faculty for Freedom University, an underground university for undocumented students.